The Millennium Star has fallen from the sky and will make one of the Mushroom Kingdom's most famous faces a Super Star. A game of Mario Party will decide who gets the prize. On the board, hit a dice to get a number between 1 and 10, and move that number of spaces on the board. After all four players have taken their turn, the teams are decided and a random minigame begins where players compete to earn Coins. 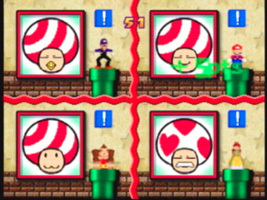 Coins are used to buy Stars from Toad, and the winner of the game is the player with the most Stars when all the turns are over. Waluigi and Daisy join the roster, and you can now buy items from Toad or the Baby Bowsers that will affect the game. When you use either the Cellular Shopper or the Bowser Phone, they play the first few notes of the Super Mario Bros. Ground theme.